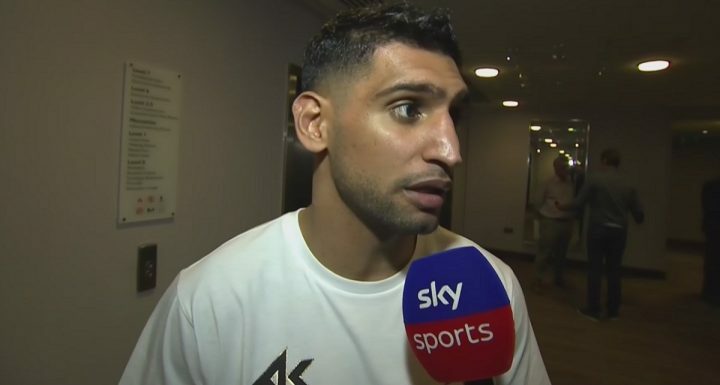 By Trevor McIntyre: Matchroom Sport plans on announcing Amir Khan’s next fight next week for July. Promoter Eddie Hearn isn’t dropping any hints who the 31-year-old Khan (31-4, 20 KOs) will be facing, but it’s expected to be a lower level opponent that he can beat without any problems. Hearn wants to keep Khan and Kell Brook winning long enough to match them against each other in a big money fight on Sky Box Office. Khan needs to keep winning and looking good to build momentum for a money match against Kell Brook for December. That’s when Hearn wants to make the fight. It’s not a question if the Khan-Brook fight takes place, it’s a matter of when. It’s entirely up to Khan, however, because he’s the one that is the decision-maker. If it were up to Brook, he’d be facing Khan in July on Sky Box Office. Brook, 31, is chomping at the bit to get the fight against Khan. Khan emerged from a 2-year hibernation last April to stop journeyman junior middleweight Phil Lo Greco in the 1st round in Liverpool, England. Khan did what was expected of him in stopping the 33-year-old Lo Greco with a blizzard of punches to get a quick stoppage. Now that Khan has that fight out of the way, Hearn had talked of wanting to step him up against a better class of opponent in the welterweight division. However, Hearn’s silence on the subject of Khan’s next opponent suggests that it could be another journeyman level fighter that he faces instead of it being a true step up. Hearn had said that he was going to have Brook (37-2, 26 KOs) take a step up in class in his next opponent in July, but instead he’s scheduled him to fight fringe contender Brandon Cook (20-1, 13 KOs) on July 28 at the O2 Arena in London, England. This is a lateral move from Brook’s last fight against Sergey Rabchenko last March. Brook stopped Rabchenko in the 2nd round to pick up his first win since beating Kevin Bizier by a 2nd round knockout. There’s still a lot of questions about how much Khan has left after his 2-year absence from the ring from 2016 to 2018. His fight against Lo Greco didn’t prove anything because he wasn’t good enough to show anything. Fighters have returned from long ring absences before – see George Foreman and Sugar Ray Leonard – but even if Khan gets another easy win under his belt against a weak opponent, you have to wonder how well he’ll do when he gets inside the ring with a good fighter like Brook or Errol Spence Jr.
A lot of boxing fans are skeptical about Khan being as good as he looked against Lo Greco, as he’s worn out his welcome with them after losses to Saul Canelo Alvarez, Danny Garcia, Briedis Prescott and Lamont Peterson. At this point, Khan is more of a fighter that is viewed as an exciting guy to watch, but not one that can be taken seriously as a top level fighter anymore. You can’t plug Khan in with a fighter like Spence, Keith Thurman, Shawn Porter, Garcia or Terence Crawford and expect him to come out victorious. Khan is still a world class guy, but he’s not at the top any longer.